Love this recipe! Didn’t have tomato sauce, so used enchilada sauce instead and it was so yummy! Thanks for all the great healthy recipes!! Gina, did you change this recipe? I could have sworn I used to put the rice in the dish and it cooked that way? Maybe I am wrong! I just wanted to say that I make these regularly and I LOVE the flavour! I even make extra "stuffing" to eat as leftovers. So delicious and so healthy. I often will sub some of the rice with quinoa to add a little more of a nutritional punch. Thanks for sharing such an amazing recipe!! Is the calorie count for this recipe per half a pepper? Hi Gina, do you happen to know the smart points of this recipe? I am making these again tonight. we love them ! 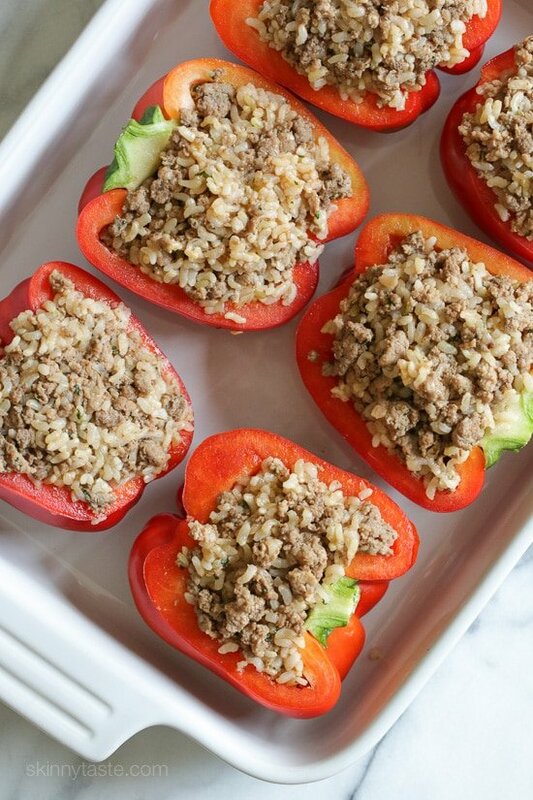 Dinner with my grandchildren tonight, and I'm making these stuffed peppers. Yes, even the sometimes finicky 6 & 4 year old love these! So simple and great with just a salad. Sometimes, if my peppers are larger and I need a little more stuffing, I'll finely chop a link or 2 of Al Fresco chicken sausage and add it to the mix with a little more rice. It gives a nice, optional flavor. Hubby does like a sauce on his peppers, so when making them for just the two of us, I'll take the extra tomato sauce and add a bit of ketchup, Worcestershire sauce, a dash of hot sauce, and put a tablespoon or so on top before the cheese. He likes that little bit of tang, sweetness and heat on top. But, this recipe is perfect as is! Best stuffed peppers that I've ever made. Delicious recipe. Made these for dinner and my husband LOVED them! Since it's just the two of us, I made two peppers – which gave us dinner plus one leftover for lunch the next day. I also made the full batch of filling and the used the leftover filling for tacos later in the week – so we got several meals out of this – which is always a plus! I love pretty much all your recipes but this one is probably my favourite (and on common rotation at my house). I have been making it with bulgur wheat in place of rice because I bought a bunch of it on sale and it turns out amazing as well. I also used chicken and beef in place of turkey a few times. 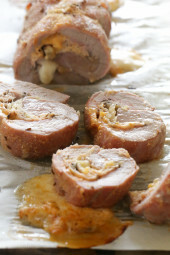 Outstanding recipe, super flexible to play around with and still get awesome results! Hi Gina! I'm a college student who LOVES to healthy cooking, so naturally I love your site! I was thinking about making a batch of these this weekend using cauliflower in place of rice and was wondering if this is a "freezer friendly" recipe? If you can freeze them, could they go directly from the freezer to the oven for those busy nights? What is the best kind of cheese to use? I just made this as a freezer meal, and it came out really well! Instead of baking the peppers, I cut the peppers and then blanched them in boiling water until soft (but not limp). Then I let them cool and dried the excess water with a paper towel. Then I filled them with the turkey filling and topped with the shredded cheese. I wrapped each one in wax paper and then put them in plastic bags. Now, when I want a quick WW lunch I can just throw one in my bag and microwave it (2.5 to 3 min) at work. I'm sure it's better if you bake it immediately, but it's still tasty and the convenience can't be beat! Thanks Gina! I absolutely love this recipe! I would like to make ahead for my husband to simply place into the oven one evening. It seems okay to do, but am wondering if anyone else has made ahead. These are great! I substitute salsa for the tomato sauce and serve with extra salsa and FF sour cream. Good stuff! This recipe was delicious! It disappeared in minutes at dinnertime! I plan to hunt skinny taste for any new recipes! Gina I made this for family today and they loved it. I would love to try more of your recipes. This was definitely a keeper. The whole family loved it! This was wonderul! I added a little bit of cayenne, black pepper and onion powder to the turkey/rice mixture and they were absolutely delicious. 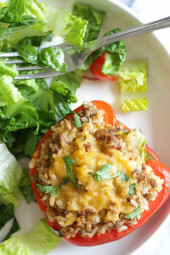 I've been looking for a good Stuffed Bell Pepper recipe…this sounds delish! I'm going to substitute the cauliflower rice (raw) for the regular rice as I am on a reduced carb food program! Can't wait to tell you how it comes out. One question…is the "chopped turkey" truly chopped turkey or ground turkey meat (99% lean)? Sundays family favorite! Great recipe! I made these last night and they were delicious and filling. The red peppers at the grocery store were small and didn't look super fresh, so I opted for green peppers instead. Wish i would have just used the red peppers for the slight sweetness factor of the red. Regardless, the filling is easy and very flavorful! I also used Uncle Ben's microwave rice to cut back on time. Can't wait to eat the leftovers! Thanks! Any idea what the points plus would be on this if we omitted the rice? Thanks! Made this for dinner today. They were DELICIOUS!!! Would this be ok without the rice entirely? I am currently working on finishing your Santa Fe Chicken with rice and don't want to have brown rice every night of the week! Any suggestions? I have made these several times and LOVE them! I am on a new restricted diet and was wondering if you know of a good substitute for the tomato sauce? I can't have tomatoes at all. I have found that quinoa works as a good substitute for the rice, but haven't quite figured out a good one for the tomato. Any thoughts? What about a tomatillo sauce? nope can't have that either. basically i can't have any food that has shown to cause any inflammation in the body at all. I did try once making a carrot puree (yes inspired by baby food haha) and it didn't really taste that good. Is the sauce mainly in it for flavor, or to help hold it together? Thanks for the response! It's for flavor but just leave it out. Made these tonight. So yummy! Thanks for sharing! So Good! I made with quinoa instead of rice and it worked perfectly! I made these tonight and they were PHENOMENAL! I did substitute beef and I added mushrooms because I had some in the fridge to use up. I have yet to make a recipe on your site that I haven't loved! Thanks! I'll definitely make this one again. It was delicious !!! I just made this with some minor adjustments. Thank you! Delicious! My husband and I agree the red peppers give this dish a little extra flavor vs green peppers!! My husband basically licked his plate clean lol!! Oh my land… these were amazing! My boyfriend, who is not a health nut in anyway really enjoyed them. They still had that tomato-y taste to them. The only things that I changed about the recipe was that I didn't add the cumin, i didn't have turkey, so I used 80/20 hamburg and then rinsed it and then last, I used veggie broth instead of the chicken. All and all a very tastey meal (9/10). I will be making these again. Just made this tonight! Very delicious recipe! Easy to follow. 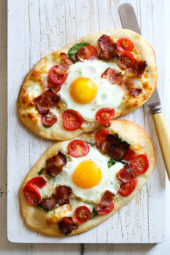 I've been looking for satisfying WW recipes and I've found them! Thank you! I am going to try this tonight. using italian ground turkey, parsley in place of cilantro, and orengano in place of cumin. Any thoughts on this?? I made these for the first time tonight and used lean bison burger. Yum! Also, I was distracted and forgot to add the long grain rice. Still delic! I skimped on lunch so had two servings, but no side salad and was very satisfied. So far loving this site. Try the zucchini lasagna as well! Made these for my boyfriend and myself and they were delish! I added about a cup of black beans and a cup of frozen corn and it made it so much better! I did add just a touch more tomato sauce. Peppers cooked beautifully and were tender. I only used about 2/3 of the filling. Saving the rest to throw in tortillas for lunch! Oh and I used brown rice! These stuffed peppers were great! When I told my boyfriend they were going to have ground turkey in them instead of ground beef, he was a little leary, but since I made them last night, he has raved about them. We had extra for him and I both to have a little lunch of them today. I prepped them earlier in the day and put in the fridge until ready to cook. I also served them with a salad and used brown rice in the recipe. Thanks for sharing! A keeper of a recipe! Delicious. I made this and only had two peppers large enough to actually stuff so I chopped half of the third pepper and threw it in the pan with the leftover mix. After my husband ate his pepper half he went back and scooped the leftovers into a tortilla and finished it off as a burrito. I also thought the leftover mix would be delicious mixed with eggs in the morning for breakfast. 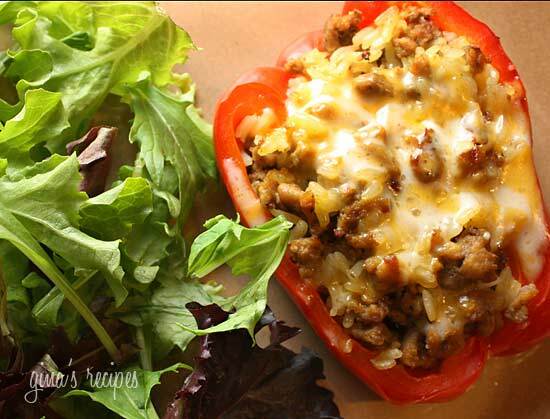 Is there a way I could make the turkey filling for the peppers in the crockpot; I have some ground turkey, that is odd & just comes out a lot better if it slow cooks. I was looking at the recipe for "Slow Cooker Picadillo Stuffed Peppers" and I was wondering if this recipe can be put in the crock pot with the chicken broth, similar to the other recipe? Gina–These were delicious…thanks for sharing! Any suggestion how to reheat the leftover stuffed pepper for another meal? This was a big hit at my house. Great recipe that I'll definitely use again! I look forward to trying some of the variations suggested by commenters. Delicious! I substituted quinoa for the rice and black beans for the turkey. Also cooked the quinoa in chicken broth for a bit more flavor. Was a total hit! Excited to try more recipes! My husband doesn't like ground turkey so Iused ground turkey with beef broth and petite diced tomatoes makes the turke more like traditional hamburger flavor for him and less calories for me. Win win. This was amazing! I used 99% lean ground turkey, and also was surprisingly out of rice, so I substituted cooked bulgur- it was AWESOME! Definitely one of our favorites. Thanks for maintaining such and awesome site- you're my go-to blog for healthy recipes! How long can these stay cooked in the fridge?? Absolutely delicious!! I would be proud to serve this recipe to company. You must have the largest peppers on the planet! I followed the recipe to the letter and had enough filling for 8 full-full-fullly stuffed peppers. I just made this for dinner and used brown rice. It was delicious and my 15 year son even liked it. Excellent, I used the whole onion and more sauce, i also used a wild rice mix, really great, my wife loved it too. Thanks for the recipie. I love to cook and I just started on weight watchers, so everything is a new adventure. Keep these inspiring recipes coming. 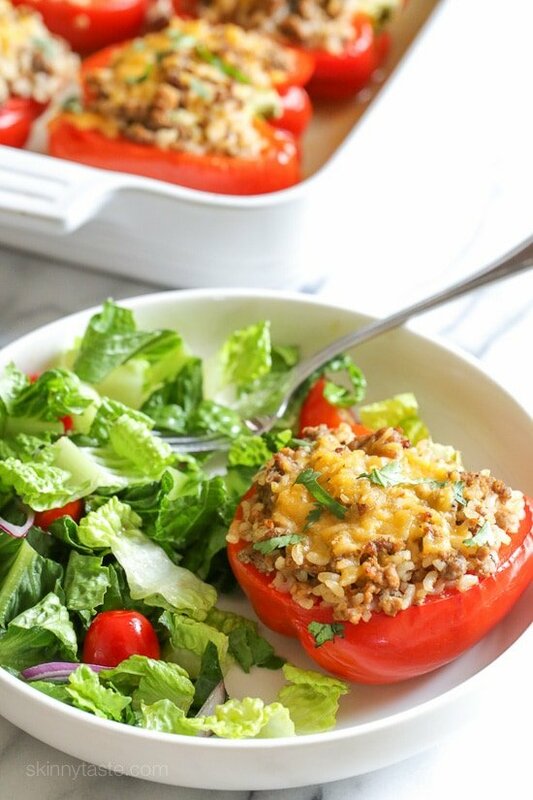 I really felt like Stuffed Peppers yesterday, but had never made them, so I googled Healthy Stuffed Pepper Recipies. Thankfully this was the first link that came up! They were amazing. I can't wait to go home and have leftovers dinner tonight! This was also the first time I've been to your website. I've been looking at a lot of recipes and can't wait to try more! Thank you for providing such a wide variety of HEALTHY Meals! These were so great! My husband wanted a healthy and filling meal, and this was perfect. We used brown rice and a little extra of the cumin powder/garlic, but otherwise kept the recipe as is and they were perfect. Served on a bed of spinach and was really surprised at how hearty a meal this was. This will definitely make it into our regular rotation! oh, and I forgot to add – I made extra of the filling, and my little ones (3 and 5) loved that in a tortilla – thought they were tacos. They LOVED them and asked for more. I'm so glad I gave them to them, they don't like peppers so I wouldn't have tried that. But a great option! A-frickin-mazing! My hubby (who is skinny and doesn't dig diet food) loved it and ate it 3 nights in a row – he doesn't usually like leftovers! I also thought these were great. Very different than my traditional stuffed peppers recipe, but I'm so glad I made a double batch and froze 1/2 because they were terrific! I was worried about what the flavor would be like….once they started cooking the smell had me salivating!!! These were so easy to make and delicious!!! So excited to add this into my weightwachers recipe file!! In the oven now 🙂 This is my second time making these and they were a huge hit the first time with my meat-loving husband. Your pic has a lot more cheese on it than mine – is it 1/4 cup cheese per pepper then? Not to sure if someone asked this or not as their are a lot of comments but could these be cooked in batches and frozen? Not sure if this was asked already because there are a lot of comments. Can I try quinoa instead of rice? i made this with quinoa instead of rice (following the same instructions) and it was amazing! What does 1 garlic mean? The whole garlic bulb or 1 garlic clove? I can't wait to try these. I did some research, and the consensus is to freeze before baking, and then thaw and bake as directed. This should prevent a mushy a pepper. Made these tonight for dinner. Used the chopped steamed cauliflower since I didn't have any rice on hand. Did think they could use some extra spice, perhaps chili powder or chipotle seasoning. Otherwise easy to prepare and make. Liked the idea of salsa instead of tomato sauce for extra flavor. Definitely gives you extra filling so I will experiment and freeze the meat mixture and try again with fresh peppers. I made these tonight! I omitted the fresh herbs, lowered the rice to 1 cup, and upped the cheese to 3/4 cup. I also messed up on the chicken broth. I put the full cup in the meat but after stuffing the peppers, I poured the remaining juices on the bottom of my pan along with 1/3 cup of more chicken broth. It came out to be 6 points plus for WW and we thought it was a great recipe! Next time we will be adding in jalapenos or a hot spice to satisfy our hot tastes. It's a definite keeper! Thanks Gina! These are the bomb dot com. The only thing I left out was the onion (not a fan), used green instead of red peppers, and they were great. I ate them for dinner last night, lunch today, and will eat them for dinner tonight! 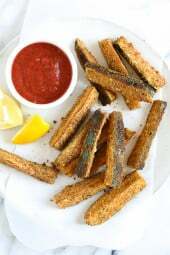 I made these with Quinoa and they were unbelievable! Delicious!! I tweaked it a bit by chopping the peppers and sautéing them with the onions, garlic, and cilantro (didn't want to turn the oven on). I also used pre-cooked brown rice. This is definitely going into my regular rotation. My roommate said this is the best thing I've ever made !! I added chipotle spice to the turkey which added a little kick ! 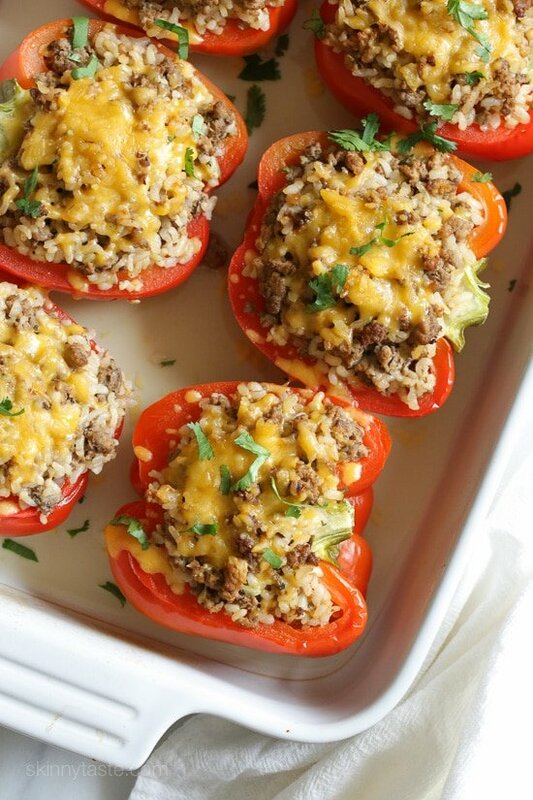 The filling is also really great as a "taco" salad..just put it over lettuce with a dab of sour cream or greek yogurt! I made this recipe times 3 for Mothers day today and my family LOVED it! I sent people home with some for lunch tomorrow too! My 6 year old son ate some extra meat mixture for dinner after having had it for lunch! He loved it. I think it had great flavor and I think the cumin and garlic powder really did it! Thanks again I love your recipes! hmmmmm not my favorite Skinny Taste recipe. We made these tonight and whilst they were nice they didn't offer any flavor punch. But I love every other recipe of yours that I have cooked so thank you. Very delicious. Great for dinner and I also brought the leftovers for lunch – so tasty. This is definitely one of my new favorite recipes. Thank you!! We just made these, and, of course, it was another winner. My husband doesn't eat healthy and especially not brown rice, and he said, we should make these more often. Score! Thanks for another great recipe! I just made these and let me just say this is the first recipe of yours that I have tried. I have only made stuffed peppers 1x before but your recipe is by far healthier and taste much better!! To make it more filling i used the suggestion of another person and added black beans and corn and used brown rice instead of white. This was soooo good! I plan on trying 2 more of your recipes later this week and if they are as good as this I will be ecstatic! My mother makes large batches of stuffed peppers then freezes them. This sounds amazing! I have made and enjoyed so many of your recipes so I owe you a big thank you! By the way, did you use an entire bulb of garlic? Good recipe. We can't get ground turkey so I used chopped chicken. Rice ratio was too much, better to half that. I planned a whole pepper per person, but that was too much, we only ended up eating 1/2 each. Also, took a long time because my rice took 45 minutes, it would be good to make rice ahead or use something that is faster. I like the idea of adding corn and black beans, that would round it out nicely. Made this over the weekend! FABULOUS!!!!!!! Used brown rice and wow was it amazing! Thank you for your excellent recipes! Made this last night, didn't have ground turkey so I used ground turkey sausage so I am sure it changed the calories a bit but they were still super good. Thanks!! These are in the oven right now – with quinoa instead of rice, since I already had some of the former cooked and ready. Can't wait for them to be done!